Starring: Simon Pegg, Nick Frost, Jason Bateman, Kristen Wiig and Seth Rogen. 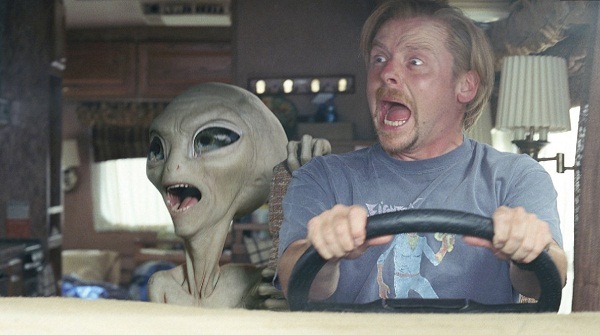 Best friends Graeme Willy (Simon Pegg) and Clive Gollings (Nick Frost) are a pair of science-fiction geeks, travelling across America in a mobile RV. They first visit the Comic-Con convention and then move through the Nevada Desert because they are interested in the supposed alien sightings. Along the way they witness a car crash on the side of the road. Investigating the vehicle, they meet Paul (voiced by Seth Rogen), a foul mouthed and obnoxious alien. While he happens to share a lot of the same eating habits as the pair, he also has special healing powers. Paul reveals he has escaped from Area 51, after being held a prisoner. He needs the boys to help take him to an extraction point so he can return home. Along the way the group is chased by some government troops, including Agent Zoil (Jason Bateman) and a father and daughter pair of Christian extremists. The girl is Ruth (Kristen Wiig) and when she ends up on the RV Graeme takes a liking to her. (Superbad, Adventureland) instead. As someone who thoroughly enjoyed Hot Fuzz and Shaun of the Dead, the disappointment with this sci-fi comedy is its distinct Americanisation and its weakened script. It's unusual considering Pegg and Frost are credited as writers and it's been developed by their regular production companies. The satire of their other two films, which cleverly took aim at specific genre films and the way they mirrored British society, is now absent. The comedy here is broader and cruder, but not necessarily funnier. It resorts to drawing American stereotypes, from hillbillies, self-serious government agents and most alarmingly, born again Christians, but with little to no purpose. There are a few laughs early on when the boys visit Comic-Con because there's no winking required. Comic-Con is what it is: geeks, some a lot older than others, dressing up in ridiculous costumes. There's also a fun cameo by Jeffrey Tambor, from Hellboy 2, as an obnoxious author. From the point that the alien arrives though, the cracks in the setup and the screenplay come to the foray. We see that Paul has the traits of a boorish human, without any explanation and then there's really nowhere for the film to go. The blame must be shared by Mottola because the film has been cut to resemble a chase movie, and the number of times that the group find themselves escaping in the RV from various pursuers grows increasingly tiresome. If one were to watch it for the sci-fi references rather than the narrative then there's a predictable assortment of E.T. and Alien related gags. There's bound to be some that only science-fiction enthusiasts will find but the most obvious ones are not as skilfully integrated into the plot as say Hot Fuzz's take on the English murder mystery and action film. It's more like a gallery for these sci-fi allusions than a proper film. One of the strengths of Hot Fuzz was quality of its script, with visible changes and developments in the characters. It was also buoyed considerably by Pegg's acting chops, playing a character that was deliberately straight throughout and letting the jokes work around him. There's a lot less Pegg can do here with a surprisingly blank character, caught somewhere between an overgrown geek and a bumbling, quirky Englishman. I wanted more laughs from him because he is a genuinely funny actor. Frost again looks to be playing the typical slob but he's slightly more interesting because he's the more skeptical of the two about Paul. The gimmick of Rogen voicing an alien who smokes and swears, wears off very quickly and Kristen Wiig has such a worthless role here that it's a wonder she agreed to it. She's made to look stupid as she overplays her transformation from a Christian extremist to a foul-mouthed pot smoker. Jason Bateman, a reliable character actor, has an equally inane part and we don't care about his role. Pegg and Frost might have written this for an American audience, but it's not what I'd call particularly funny or witty. Phone home gentlemen.